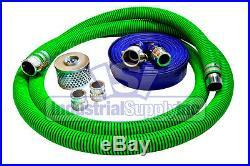 Trash Pump Water Suction FCAM x MP w/50' Discharge Hose Camlock Kit. Assembled in USA, creating local jobs! 1 - 3 x 20ft EPDM Rubber trash pump suction hose assembly installed with (1) ea Male Pipe fitting and (1) ea Female Camlock with 2 banded clamps at each end. More flexible than conventional Green PVC suction hose, good for year round use in all weather conditions. 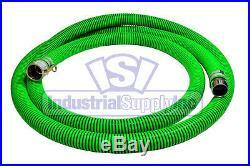 You may receive either a gray ribbed or green ribbed EPDM hose depending on availability, as we stock both colors. 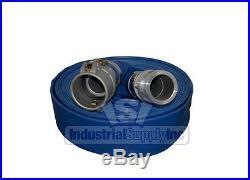 1 - 3 x 50ft trash pump blue discharge hose assembly installed with (1) ea Male Camlock Fitting and (1) ea Female Camlock Fitting with 2 center punch band clamps at each end. This hose is rated at 80 psi. 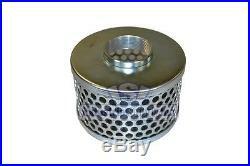 1 - 3 Steel round hole strainer. 2 - 3 Male Camlocks x Female Pipe, to thread onto trash pump. The suction hose kits and water discharge hoses, must have functioning capabilities and must have no damage to them in order for a return. Meaning no cosmetic damage to the hose or fittings; or the usage of the hose as well, we will not accept them. Just make sure you input the right information into the right fields when ordering. What are cut-off times for getting an order out same day? UPS orders must be placed before 12:00 P.
How long does it take to process orders? Ritish S tandard P ipe P arallel. Ritish S tandard P ipe T aper. American Standard Fire Hose Thread. (1 National Hose Thread is C hemical H ose T hread). Arden H ose T hread. Ron P ipe S traight T hread. Ron P ipe T hread. American Standard Straight Mechanical Joints N ational P ipe. Traight Iron P ipe T hread. Apered I ron P ipe T hread. Warrants the products described herein, and manufactured by Industrial Supply to be free from defects in material and workmanship. If you receive a product that has been deemed defective. The foregoing constitutes Industrial Supplys sole obligation with respect to damages, whether direct, incidental or consequential, resulting from the use or performance of the product. Problems are usually misunderstandings and with a little patience can be easily resolved. When customers give us the opportunity to respond, they are never disappointed. Monday Friday 7:00 5:30 pacific standard time, Saturday 8-12 pacific standard time. It is also recommended to give a contact number in case of any questions. Over the years we have grown into a diversified market based that now services customers all over the world. We enjoy listening to our customers needs and ideas while working hard to provide the best service and delivering the highest quality of parts. We believe service is our number one customer. We hope our commitment to provide our customers quickly and efficiently with competitive prices will keep you coming back. The item "3 EPDM Trash Pump Water Suction FCAM x MP with50' Discharge Hose Kit" is in sale since Tuesday, August 26, 2014. 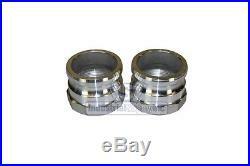 This item is in the category "Business & Industrial\Hydraulics, Pneumatics & Pumps\Pumps & Pump Accessories\Other Pumps". The seller is "industrial_supply_inc" and is located in Bellingham, Washington. This item can be shipped worldwide.